Content might be the king but in the end, we need to realize one more thing that while this content is being consumed by people, in order to get better ranked in Google, you can at least keep the robots in mind while creating the same. 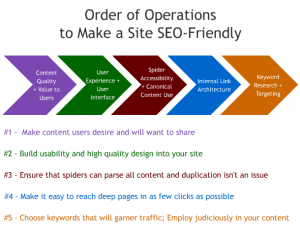 I truly believe that one can naturally create great content good for both the consumers and the Google spiders. This is especially true for business websites which are not really into blogging and regular updates. One strategy which comes to mind is writing for an old man emphasizing on key things a certain number of times and making it as easy as possible for them to understand what you are trying to say.